So, I’m on vacation this week from work, and decided to spend last weekend in Chattanooga with my brother and his family. Oh, let’s face it. I went down to spend the weekend with my 2-year-old nephew. My brother has been replaced in my affections. Sorry, bro. Don't be deceived by their sweet and innocent appearance. 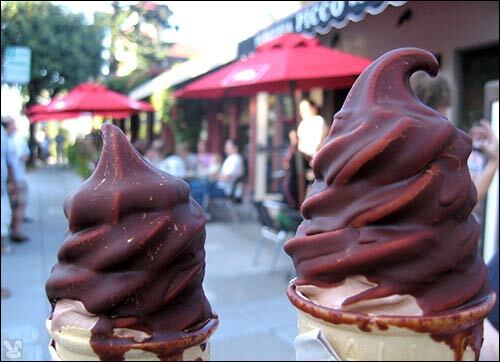 These chocolate-dipped cones are out to get you! The weekend was fun, but Mom and I had to leave on Sunday because Sunday is chinchilla cage cleaning day, and it takes about an hour and a half from start to finish. My brother wanted to borrow my mom’s van, so we took their car. We left around 2 p.m., and halfway home, about an hour later, we got the munchies. There’s not much to choose from in Dayton, TN, but there is a nice, new McDonald’s on our side of the highway, so we thought we’d stop in, use the toilet, and get a snack. It was too early for dinner, so we decided to try their chocolate-dipped ice cream cones, which we’d never had before. It’s not that it wasn’t tasty. I think it was tasty. But as soon as the Mickey D’s lady handed them to us, they started to melt. Fast. Very fast. We had taken them out into the car, intending on enjoying the ice creamy treats on the drive home. We never made it out of the parking lot. First, we had to eat all the chocolate as quickly as possible because it was sliding off. Then we had to down the ice cream. If you had been able to see us, it would have looked like we were in an ice cream eating competition. I had one hand cupped underneath the cone to catch the drippings. But it didn’t help. By the time I was down to the cone, I had ice cream on my glasses, on my nose, in my lap, on the car console (uh… sorry, Matt), all over my hands and even in my hair. It was by far the messiest thing I have ever eaten. It wasn’t that hot out. I don’t know why they started melting so fast. All I know is, I’ve never had that much trouble with a dipped cone from Dairy Queen. I’ve learned my lesson. Next time I want a dipped cone, I’ll go to the experts at Dairy Queen, because trying to wash ice cream-matted clumps out of your hair is not a pleasant experience.